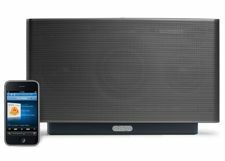 Sonos integrates Apple AirPlay and launches Android app | What Hi-Fi? Sonos has released a software update that brings Apple AirPlay support to the multiroom music system – provided you buy yourself an Apple Airport Express. The latest 3.4 software update, available to download from 2pm today, will allow you to stream music direct from an iPhone, iPod Touch or iPad to your Sonos system. Also included in the update is support for iOS multitasking support and a promise of faster wireless control using your iPhone or iPad as a remote. Last but not least on a big day for Sonos, is the launch of the Sonos Controller for Android, bringing the Sonos remote controller application to all Android smartphones with Android 2.1 software or later. Adding AirPlay to your Sonos systems requires an Apple Airport Express – yours for around £80 – to be connected to any one of your Sonos ZonePlayers via an audio and an ethernet cable. This will then connect to all your Sonos devices. An AirPlay tab will then appear, once you've installed the Sonos 3.4 software update, allowing you to stream to Sonos from an Apple portable device. Sonos claims it's now the only system that can send music from one Apple portable device to multiple rooms using 'AirPlay Party Mode'. The company is also keen to reiterate that it's the only system that allows you to play different tracks from your iTunes library in different rooms in your house. Also out today is the Sonos Controller for Android. Available for free on Android Market, it allows you to remotely control your Sonos system from an Android smartphone. You'll need a smartphone that sports Android 2.1 or higher and a screen with an HVGA 320 x 480, WVGA 480 x 800 or WVGA 480 x 854 resolution. The app sports voice search and uses your handsets hard keys as volume controls as well as offering the standard Sonos controls. The 3.4 software should be live now, as should the Controller for Android. And if you've got an Airport Express, you can activate AirPlay on your Sonos today.